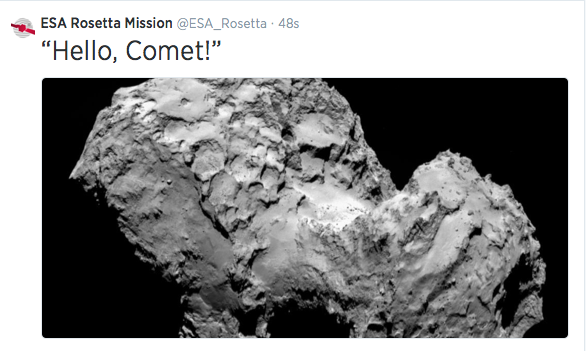 After a 10 year, 5 month, 4 day journey the European Space Agencies Rosetta spacecraft has arrived at Comet 67P/Churyumov–Gerasimenko. 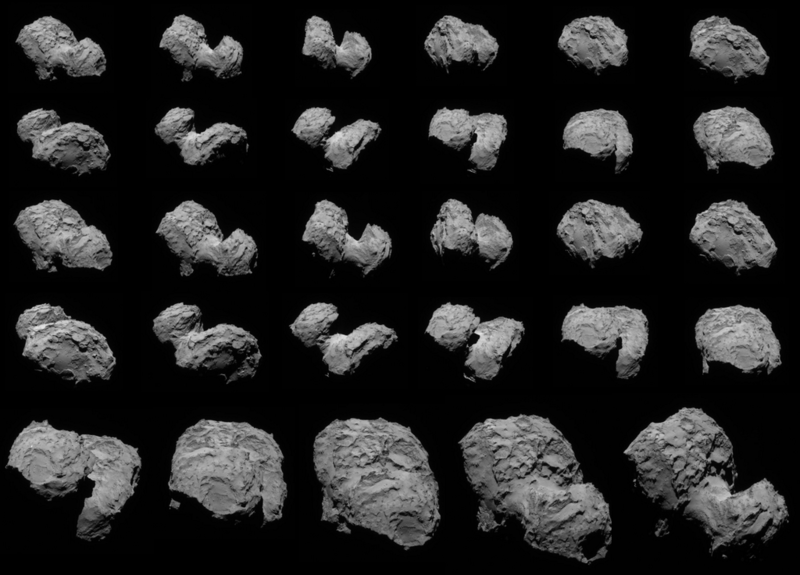 Having spent the last few weeks refining it’s approach and returning amazing images (see below) of the Comet it finally arrived in it’s initial orbit earlier this morning. Due to the small size and low gravity of the Comet the spacecraft is in a triangular orbit which is controlled by thruster firings. The Rosetta spacecraft consists of two separate vehicles and orbiter and lander which is named Philae. Now that the spacecraft is in orbit the mission team will now spent the next few weeks taking images to determine the best location for the lander which is expected to touchdown on the comet in November this year. Once on the surface the lander will being it’s science mission, the two vehicles will observe the comet as it travels around the Sun over the 13 months from November 2014 to December 2015 returning unprecedented data of the processes that occur as it approaches the Sun and then moves away again. ALICE: Ultraviolet Imaging Spectrometer – analyses gases in the coma and tail and measures the comet’s production rates of water and carbon monoxide/dioxide. It also provides information on the surface composition of the nucleus. CONSERT: COmet Nucleus Sounding Experiment by Radio wave Transmission – probes the comet’s interior by studying radio waves that are reflected and scattered by the nucleus. COSIMA: COmetary Secondary Ion Mass Spectrometer – will analyse the characteristics of dust grains emitted by the comet, including their composition and whether they are organic or inorganic. GIADA: Grain Impact Analyser and Dust Accumulator – measures the number,mass, momentum and velocity distribution of dust grains coming from the nucleus and from other directions (reflected by solar radiation pressure). MIDAS: Micro-Imaging Dust Analysis System – studies the dust environment around the asteroids and comet. It provides information on particle population, size, volume and shape. MIRO: Microwave Spectrometer for the Rosetta Orbiter – is used to determine the abundances of major gases, the surface outgassing rate and the nucleus subsurface temperature. OSIRIS: Optical, Spectroscopic, and InfraRed Remote Imaging System – has a wide-angle camera and narrow-angle camera that can obtain high-resolution images of the comet’s nucleus. ROSINA: Rosetta Orbiter Spectrometer for Ion and Neutral Analysis – contains two sensors which will determine the composition of the comet’s atmosphere and ionosphere, the velocities of electrified gas particles, and reactions in which they take part. It will also investigate possible asteroid outgassing. RPC Rosetta Plasma Consortium – In this instrument, five sensors measure the physical properties of the nucleus, examine the structure of the inner coma,monitor cometary activity, and study the comet’s interaction with the solar wind. RSI: Radio Science Investigation – Frequency shifts in the spacecraft’s radio signals will be used to measure the mass and gravity of the comet nucleus in order to deduce its density and internal structure, to define the comet’s orbit, and to study its inner coma. RSI has already determined the mass and density of the asteroid Lutetia during the flyby in 2010, and studied the solar corona during the periods when the spacecraft, as seen from Earth, was passing behind the Sun (in 2006 and 2010). VIRTIS: Visible and Infrared Thermal Imaging Spectrometer – maps and studies the nature of the solids and the temperature on the surface of the nucleus. Also identifies comet gases, characterises the physical conditions of the coma and helps to identify the best landing sites. APXS: Alpha X-ray Spectrometer – is lowered to within 4 cm of the ground, it detects alpha particles and X-rays, which provide information on the elemental composition of the comet’s surface. ÇIVA: Six identical micro-cameras take panoramic pictures of the surface. A spectrometer studies the composition, texture and albedo (reflectivity) of samples collected from the surface. CONSERT: Comet Nucleus Sounding Experiment by Radiowave Transmission – probes the internal structure of the nucleus. Radio waves from the CONSERT experiment on the orbiter travel through the nucleus and are returned by a transponder on the lander. COSAC: Cometary Sampling and Composition experiment – is one of One of two evolved gas analysers, it detects and identifies complex organic molecules from their elemental and molecular composition. PTOLEMY: is an evolved gas analyser, which obtains accurate measurements of isotopic ratios of light elements. MUPUS: Multi-Purpose Sensors for Surface and Subsurface Science – uses sensors on the Lander’s anchor, probe and exterior to measure the density, thermal and mechanical properties of the surface. ROLIS: Rosetta Lander Imaging System – is a CCD camera to obtain high-resolution images during descent and stereo panoramic images of areas sampled by other instruments. ROMAP: Rosetta Lander Magnetometer and Plasma Monitor – is a magnetometer and plasma monitor study the local magnetic field and the comet/solar-wind interaction. SD2: Sample and Distribution Device – drills more than 20 cm into the surface, collects samples and delivers them to different ovens or for microscope inspection. SESAME: Surface Electrical Sounding and Acoustic Monitoring Experiments – Three instruments measure properties of the comet’s outer layers. The Cometary Acoustic Sounding Surface Experiment (CASSE) measures the way in which sound travels through the surface. The Permittivity Probe (PP) investigates its electrical characteristics, and the Dust Impact Monitor (DIM) measures dust falling back to the surface. For more information on the spacecraft check out the mission page here, for the latest images and news check out the mission blog here. blog and will come back very soon. I want to encourage one to continue your great writing, have a nice day! This post is so good to read. Great!! Thank you very much for sharing, I will post it on my blog to share to my families? I enjoy reading your web sites. Thanks for your time! Studying this information So i’m glad to express that I have a very good uncanny feeling I came upon just what I needed. I so much certainly will make sure to don?t put out of your mind this site and give it a look regularly. say that I’ve really loved browsing your weblo posts.